Beer Garden Open at 12noon-10pm Enjoy some local Lost Coast Brews! 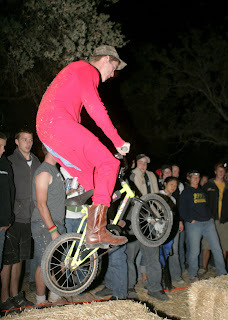 Bring your kids bikes and costumes and take on Pixie cross World Champion Brian Astell!!! The creators of the "Greatest One Night Reggae Show on Earth"--the annual Sting concert, are Riding West at the Llandilo Cultural Centre in Sav-la-mar in West Moreland, JA on December 8th. Headlined by Reggae's most dynamic soldier Jah Cure, Supreme Promotion's highly anticipated event also features the 'Don Gorgon' Ninja Man, Busy Signal, Spice, Demarco, Jah Mason, Hero, Shane-O, Beneto, Edge Michael, Whiskey Bajeo, Iyah Blazze, Kane Juice, and SK.